This is such a beautiful and peaceful tale that it was a joy to read. I absolutely adore the soft and colorful watercolors, the well-rounded characters with such expressive faces and bodies, and the gentle humor infused throughout the story. My daughter was not immune to the magic of the story either since we read it multiple times and the images are so pleasing to the eye. It is no surprise that it is a Bccb Blue Ribbon Picture Book Awards book. Elsie is a farmer with two companion cats Fluff and Gordo. Her specialty and passion is her cabbages which she had been growing and selling for years. One morning when she and her cats go to pick cabbages, they discover only stumps and “for a moment, she lost control.” The way Erika Oller paints Elsie’s reaction is funny yet compelling because we can all empathize with having lost something meaningful to us. But Elsie courageously puts herself back together because “she would not cry over shredded cabbages,” and comes up with a plan to find out what happened to her cabbages. She parks herself in the cold field to watch for the culprit but falls asleep before catching them. When she wakes, “she felt defeated” and drags herself to bed. As she sleeps, Fluff and Gordo perform their secret good deeds and help figure out the mystery (there are hints in the illustrations throughout the story). 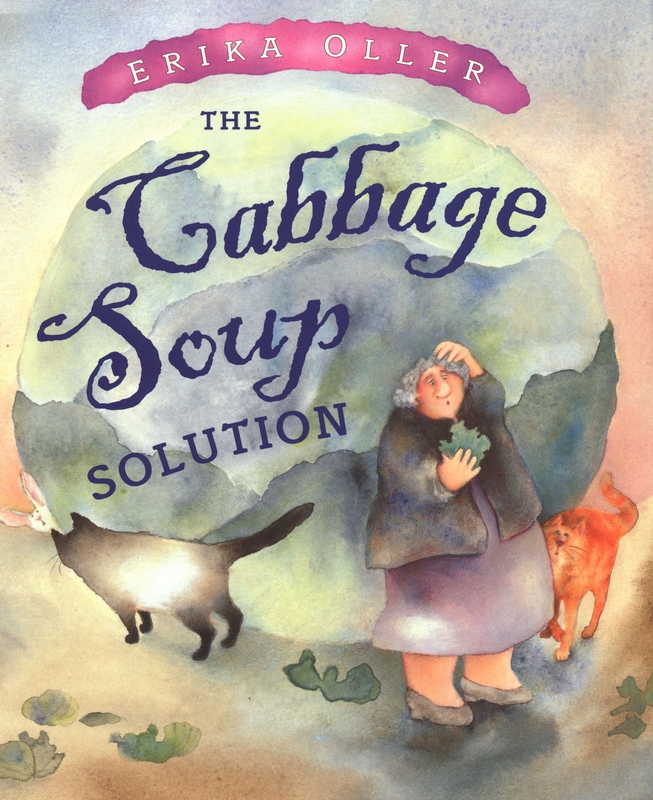 When Elsie wakes, she decides to replant the cabbages and also make a batch of cabbage soup and is surprised to find all the soup ingredients sitting on her doorstep. When it’s time to eat, she has unexpected visitors and invites them to eat and stay with her. One of my favorite illustrations in this story is the image of “with bellies full, everyone fell fast asleep.” The visitors assist with the replanting and Elsie’s garden improves so that there are plenty of cabbages to go around. I found it to be a very veg-friendly tale with Fluff and Gordo as well as Elsie demonstrating such compassion and generosity that it warms the reader. I even enjoyed Oller’s dedication to her daughter, “who has taught me how to eat my vegetables.” The only criticism of the book is that Elsie serves her cats warm milk, which in reality is not good for cats (vegetarian parents should note there is mention that the cats decide to eat fish instead of cabbage soup). I highly recommend this heart-warming story where the culprits are not captured and punished yet they do make reparation and the main character Elsie demonstrates her strength in taking a negative event and moving beyond it to make bigger cabbages and a better life, as well as new friends.